Identification: Creeping or twining perennial vine that can grow up to 27 millimeters a day in tropical climate. It is characterized by branched stems on which heart-shaped or triangular leaves are arranged in opposite pairs. The leaves are thin, generally with an acute tip and a broad base and measure from 4 to 13 cm long. The plant produces white to greenish-white flowers, in heads 3 to 5 millimeter long, arranged in dense terminal or axillary corymbs. A single plant can cover over 25 square meters within a few months, reproducing rapidly vegetatively by rooting and sexually by dispersing some 40,000 seeds per year. The seed is black, linear-oblong, five-angled and about 2 mm long. Dispersal is facilitated by a terminal pappus of 32 to 38 soft white bristles which can carry the seed large distances on air currents and attach itself to the hair of animals. 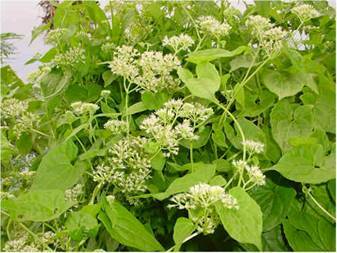 This weed grows best in soils rich in organic matter and sunny areas of high humidity. It is found in disturbed forest, stream banks, roadsides, pastures, plantations and cultivated crops. Although it does not like deep shade, it tolerates shaded locations, growing rapidly over shrubs and trees in disturbed forested environments. Original Distribution: Native to Central and South America, where it grows in and near forests as well as along rivers and streams and in disturbed areas such as roadsides. Current Distribution: It has been reported as a weed in India, Bangladesh, Sri Lanka, Mauritius, Thailand, the Philippines, Malaysia, Indonesia and Papua New Guinea. It has also been identified in Australia and is considered invasive in many of the Pacific Islands. It is also present in the United States but is listed as a native weed by the Department of Agriculture (federal status of noxious weed). 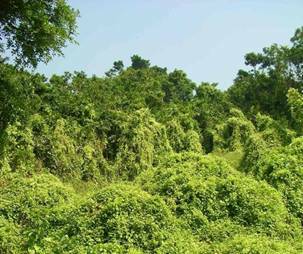 Site and Date of Introduction: The Bittervine is believed to have been introduced to India and several of the Pacific Islands in the 1940’s. Mode(s) of Introduction: The weed was introduced to India as a cover crop and as camouflage for airfields. It is also believed to have been introduced in Pacific Islands such as Vanuatu by the American Army for camouflage during World War II. Reason(s) Why it has Become Established: The plant is adapted to a wide range of habitats and can grow easily from the tiniest fragment of vine as well as from seed. The vine will root readily when in contact with moist soil or when left on plant debris and will grow at an extraordinary rate once established, climbing on any vertical support it finds in its way. The plant also produces a high output of viable seeds that can spread a wide geographic range through air currents and can readily germinate on any moist bare soil. The vigor and adaptability of Mikania micrantha may be attributable to a high biochemical capacity for photosynthesis. In a study conducted in South China, comparing M. micrantha to M. cordata, an indigenous but non invasive vine, it was shown that M. micrantha had higher Vcmax and Jmax than M. cordata allowing it to acclimate to brighter environments and a larger pool of available carbon. Ecological Role: The ecological role of the Bittervine is not well documented although it has been reported to be used as a ground cover and suitable for grazing and animal feed. It is therefore likely that the plant could be a food source for wild fauna. Benefit(s): There are few published uses for this plant as most of the literature focus on its invasive nature. However, aside from its possible use for animal grazing, the plant has been reported to be used for medicinal purposes by curanderos (healers) of Indians and other ethnic groups throughout Central America, specifically as anti-infectives. It is also being used against insect bites and rashes in Fiji where it is known to appease cases of poison ivy when crushed and mixed with water. The traditional medicinal use of the plant is prompting Heath organizations to study its antibiotic property for applications in the pharmaceutical industry. Threat(s): Once established, Mikania micrantha spreads at an alarming rate, quickly colonizing gaps in disturbed environments, ultimately damaging or killing other plants by cutting out their light or smothering them. In addition to competing with other plants for water and nutrients, it is also believed to interfere with the nitrification process and to release substances that inhibit the growth of other plants. Its impact in many tropical regions has escalated due to widespread cutting and degradation of natural forests. Initially colonizing the degraded forestland, it then invades adjoining gardens, causing severe damage to natural forest ecosystems as well as agro-forestry, home-gardens and plantations. In Samoa, it is reported that the plant has caused the abandonment of coconut plantations. It also causes serious problems in oil palm, banana, cacao and forestry crops, and in pastures. It is considered one of the three worst weeds of tea in India and Indonesia and of rubber in Sri Lanka and Malaysia. Major threats are therefore crop yield reduction, loss of biodiversity and prevention of forest regeneration. Control Level Diagnosis: "Highest Priority "
Eleven Pacific Ocean countries have rated the Bittervine among their top 10 worst weeds and it is listed among 100 of the “World’s Worst” invaders by the Invasive Species Specialist Group (ISSG). Physical: Physical control is difficult since the seeds disperse easily and vines root readily in contact with moist soil. Repeated slashing or mowing, before the plant flowers and during periods of reduced growth (in regions with a dry or cooler season) can help control the spreading of the plant but will not eliminate it. Chemical: Herbicides seem to provide the only suitable method of control at present. However, spreading herbicides to large forested area for example is not always feasible and can be damaging to the environment if applied in large quantities. The allelopathic potential of other plants against Mikania micrantha seedlings is being evaluated and it was found that the leaves and flowers of the flame tree (Delonix regia) showed strong phytotoxicity. It may therefore be possible to use allelochemicals as a natural herbicide to control the vine. Biological: A number of very promising natural enemies of Mikania micrantha are known in Central and South America. A thrips, Liothrips mikaniae, a bug, Teleonemia sp, several beetles and an eriophyid mite, Acalitus sp have shown some specificity to the plant and could have considerable potential as biological control organisms. Fungal pathogens have also been investigated in India as a potential biological control method. Of those, the rust Puccinia spegazzinii originating from Central and South America, may turn to be the ‘silver bullet’, as it has proven to be totally specific against the plant. The rust results in leaf, petiole and stem cankering and death of the whole plant. Deng et al. (2004): Gas exchange characteristics of an invasive weed species and its indigenous congener. Bot. Bull. Acad. Sin. 45: 213-220. Raghubanshi, A. S., L. C. Rai, J. P. Gaur and J. S. Singh. (2005). Invasive alien species and biodiversity in India. Current science, Vol. 88, No. 4: 539-540.